AIDA's newest member of the fleet, AIDAperla, is still on its way from the shipyard in Japan to its homeport in Spain, but AIDA is already looking forward to their next (thirteenth) ship which will enter service in December 2018 and be based in the Canary Islands initially. It's so far out, AIDA hasn't even named it yet, but they will open it for sale next week on June 1. The keel isn't even scheduled to be laid at Meyer Werft until September, but AIDA is beginning to reveal some of the design details. Holland America is known for their elevated and varied dining experiences. So you wouldn't necessarily think of them as the burger capital of the cruise industry. But their chefs know that burgers themselves - even meatless ones - can be elevated and varied and come in many different varieties. They've been quietly developing different burgers and adding them to the menus in just about every restaurant aboard every ship in the fleet. Around just about any corner, you can get a good burger on Holland America ships. With Sunday (May 28) being National Burger Day, other lines are doing publicity stunts in connection with it, but Holland America is more or less passing, because they feel every day is Burger Day on their fleet. 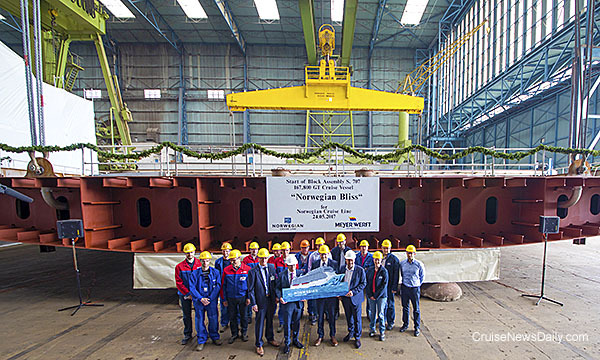 Meyer Werft began the block assembly of project S.707 today at their Papenburg yard, or to the rest of us we'd say they laid the keel for Norwegian Bliss when the first 350-ton block was lowered into the dry dock today. The first block o Norwegian Bliss was lowered into the dry dock at Meyer Werft in Papenburg today. Holland America Line is adding Cuban ports of call to eleven Caribbean itineraries this winter from Ft. Lauderdale. Majestic Princess has begun its 37-day positioning voyage from Rome to China. When Crystal Serenity makes its second crossing of the Northwest Passage through the Arctic this summer, passengers are going to have a wider, more varied selection of experiences available off the ship. Crystal has spent the winter creating and curating new types of shore excursions. As a result, more than 100 new shore excursions await Crystal Serenity passengers, most of which are not offered with any other cruise line. The Mexican Riviera is coming back. Cruise lines are beefing up their offerings both in terms of hardware used and in terms of number of sailings. The number of sailings is being boosted, but the real growth seems to be in the hardware. Princess today announced that during the winter 2018-2019 season, they will have 35 sailings from Los Angeles and San Francisco to Mexico. Carnival celebrated American Craft Beer Week by creating a new beer, created on, brewed on and served on Carnival Vista only. Former Celebrity chief Dan Hanrahan returned to the cruise industry last week. The case of those drugs aboard Island Princess took another unusual twist late last week. And you can see how Legend of the Seas became TUI Discovery 2 in the video below.